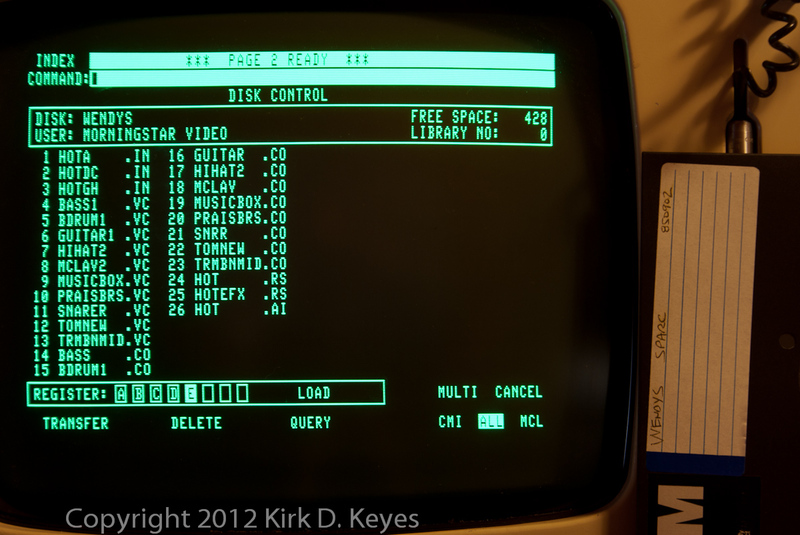 My Series IIx Fairlight CMI came with a large collection of disks. The majority of the disks came from a company called Morningstar Video of Columbus, Ohio. 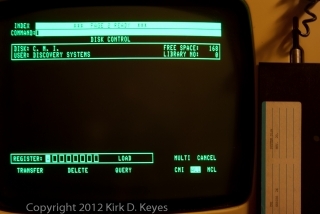 It appears that Morningstar received their Fairlight at the end of March, 1984, as someone there made backup copies of the Fairlight USA library disks that must have come with their CMI. These backup disks have a USER name of either MORNINGSTAR or MORNINGSTAR VIDEO. I also received a heavy duty, cloth-covered, metal hinged 3-ring binder that was filled with library disks. The inside cover of this binder has a sheet of paper taped to it that says “Morningstar Video Productions, Inc. Shot Log”. It also lists the address of Morningstar Video as 3360 Tremont Road, Columbus, Ohio 43221. Hand written on the sheet are instructions on how to format new floppy disks. 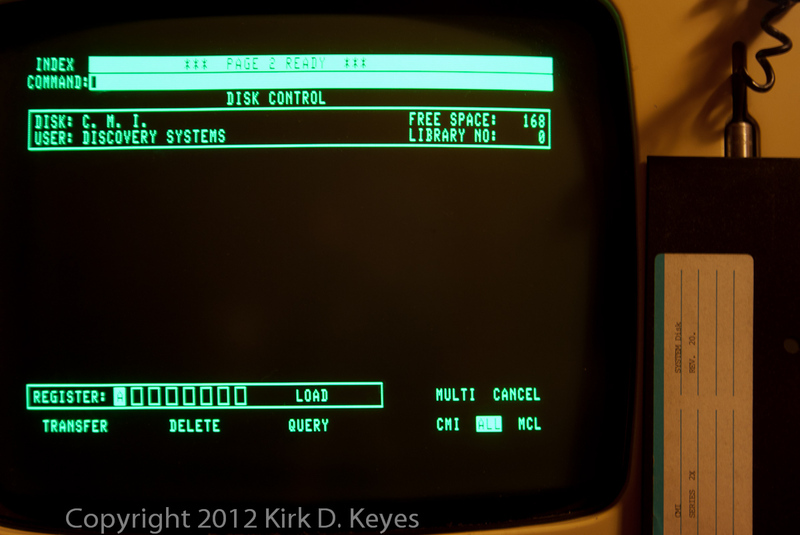 I also have a couple disks that have a USER of “DISCOVERY SYSTEMS”. Jeffrey M. Wilkins, who had cofounded CompuServe, was let go from his position as CEO at CompuServe in 1985. Wilkins moved on after an unsuccessful attempt to buy back to CompuServe and founded Discovery Systems in 1985 to offer laserdisc-based training videos. Discovery Systems was notable since it offered both video production to produce content as well as the manufacture of the laser disks in a suburb of Columbus, Ohio, building a new plant to produce laser discs. In order to produce this content, Discovery Systems soon bought Columbus-based Morning Star Video Productions. By 1989, Discovery Systems had nearly gone bankrupt and changed its name to Metatec, Inc. Metatec went on to create, manufacture, and distribute CD-ROMs and DVD-ROMs for over 1000 clients including General Motors and Harcourt Brace. (See http://www.fundinguniverse.com/company-histories/metatec-international-inc-history/ for more information on the history of Metatec, Inc.
With a some searching of the Interwebs, I was able to track down Russell Nagy who was the keyboardist that used Morningstar’s Fairlight. Russell, who now teaches at Capital University in Columbus, OH, has graciously sent me a few of the pieces he produced using the Morningstar Video Fairlight. Russell has saved a Morningstar Video brochure and send in a scan of their music studio. The first piece presented here is “Action TV Theme”, probably for WTVN-TV Channel 6, Columbus, OH.